Despite the fact that this is not the best and biggest site to meet and find bikers in and around your town or city, BikersNearby.com is no doubt a dating website which is continuously growing in popularity. For this reason, this is something that you must be more familiar with. If you have plans to join this site anytime soon, reading this review will help you determine if this is something that will suit you. Bikers Nearby boasts of a basic design but you can be sure that it can get its job done. 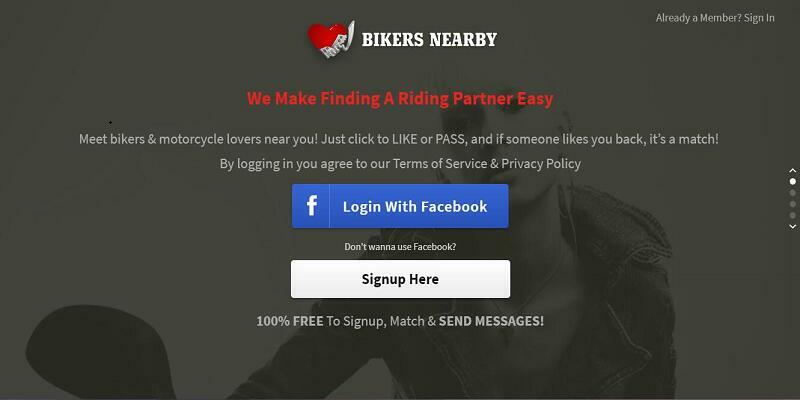 As far as biker dating websites are concerned, simpler is sometimes better. And you can see that Bikers Nearby is really very simple. In fact, it resembles Tinder in both functionality and design. It is also easy to change and tweak your profile and add your new photos. It is also easy to navigate. Once you see bikers that look appealing to you, you may click on their picture to determine more about them. What happens if you click on the picture is that you get a few more photos to check out. It depends on how many photos that person has uploaded. You’ll get to read about what bikers had to say about herself or himself as well. One of the amazing features is its Go Private feature. When you’re using it, this means that only the members that you’ve personally shown interest towards will see you. Therefore, if you like some privacy and never want each biker on the network to see your profile and picture, you may use this feature. Another good thing about BikersNearby.com is that your preferences are easy to set. You may set how far or close you want your bikers to be to you in both kilometers and miles, perhaps you want your dates to be local or you have nothing against the long distance relationships. You may also decide the gender you’re interested in and distinguish the age group of interest. Upon entering the site, the first thing that comes to mind is the fact that this is very simple and easy to use. For those who have used or are using other famous dating apps, you will know right away what this is all about. Basically, you can browse through pictures of possible matches and decide if they catch your interest or not. Although you can always check out the website using your browser, its mobile app is said to be much better. if you like to make the most out of your experience, the app is definitely the best way to go. All in all, it is a decent biker dating website with great potential. It is easy to use and set up. The feature set is good and there are plenty of people using it and the experience was a positive one. BikersNearby.com really shines brightest once you’re using the Bikers Nearby App rather than logging in from your computer.